I feel that talking about it on more of a personal level is helpful to so many of us. Having anxiety or dealing with depression have a weird stigma against them and the only way we can break through that is by understanding them better and how it affects each one of us differently. Being a mom of three who struggles with anxiety, and whose two oldest struggle with anxiety and ADHD, i wanted to interview someone who has experience in the field and in her own home. 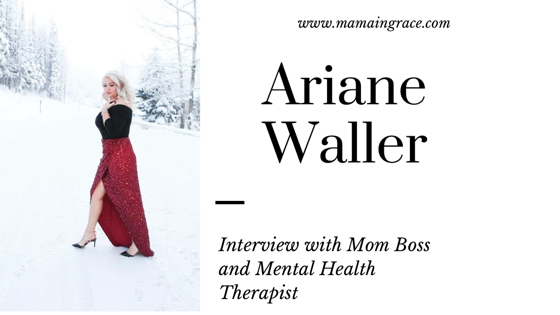 Ariane Waller is a Licensed Clinical Social Worker (LCSW) with experience in working with children in a school setting, and now she even has her very own private practice located in the Flathead Valley. Anxiety and depression have the tendency to creep up on anyone of us. Even those who are teaching others how to live a healthier and happier life; so i wanted to touch on that a little bit as well. Parenting, Mental Health, and helping others are huge passions of my own. So knowing Ariane personally, I wanted to ask her some questions about how she gets through the day to day; And similarly, what she teaches her clients on how to cope with these very similar struggles that most of us are living with. What has fueled your passion to study Mental Health and to become a Clinical Therapist. How long have you been in the field? When I was 17 years old my parents sent me to a behavior modification boarding school for nine months. This facility has since been shut down for abuse. It had zero mental health care options and was filled with teens who needed it more than most. I realized that maybe one percent of the staff had any sort of formal education right away. From that point forward I made it my goal to become educated in the mental health field so that I could provide care and support to those like myself. I have worked in a social work setting for 9 years and this is my 3rd year as a licensed therapist. I started in a shelter for children 0-12 who needed emergency placement due to being suddenly removed from their caregivers. I have gone from there to public schools and now private practice. From your standpoint, do you notice a stigma against Mental Health? Is it getting better? There is absolutely a stigma, although I truly believe it is getting better. It wasn’t that long ago that people were locked up and cruelly tested on for common mental health disorders. There were very few interventions, tools, and skills provided to cope and heal. Now we have many more options, and some health insurance is paying for treatment. These are steps in the right direction. What are some words of advice that you find the most difficult to practice in your own life? Wow, this is a great question. I think the hardest thing for me personally to do is stop and think when I am triggered, angry, or in a panic. I often don’t take the time to calm down and step back from the trigger before I react. I teach my clients to respond after taking the time to think through the issue, separate it from a human, and go in after the body has returned to baseline. As a working parent, what do you find the easiest way to talk with your children? Before bed! Isley is not old enough to really have deep conversations, but Carter has blown me away with the “adult“ material conversations he brings to the table. From about the age of four we have talked about anxiety, homosexuality, transgender, equal rights, racism, equality, bullying, homelessness, poverty, religion, abuse, death, human anatomy and biology and so much more. I give him time to talk when I tuck him in. Nothing is off limits. He knows we can talk about anything. Do you believe that all children should be parented differently? Yes. And doing this is going to start with instilling the belief in your kids that fair is not equal fair is getting what you need. This helps kids to see that fair for one is not the same for the other, and that is absolutely OK. Teaching empathy at a very young age, showing kids how to put themselves in someone else’s shoes, it’s going to be key in their comprehension of fair not be equal. What symptom have you noticed the most in children dealing with anxiety and/or depression? Anxiety and depression look so different for each and every person. As far as children go, they are so resilient, their symptoms can change quickly. Some common things I have observed include irrational fears, sleep disturbance, separation anxiety, somatic illness, ticks, hoarding, tantrums, highly emotional, asking lots of fear based questions, self-sabatoge, easily giving up, refusing to try, general apathy, sweat and panic, self harm, feeling worthless, lack of energy and or focus, lack or surge in appetite, and so much more. Do you see a common correlation between Anxiety and ADHD? Symptoms can look similar in these two diagnoses and they are often coexisting. I’m not sure why that is. I would have to dive into that a little deeper. Of course there is the genetic factor, and then the fact that ADHD medication is often a stimulant with anxious behavioral side effects. If there was one thing you could share with each person who is caring for a child with Mental Health struggles, what would you give them as a piece of advice? First and foremost- you are enough, and you are doing a great job. Try to approach all situations with unconditional positive regard. This means you go in with the assumption that they are doing the best they can at the time with the tools they have. Use positive language. Show hope for the future. Be excited for the day when they do show improvement. Seek out furthering education reading materials, podcasts, and classes. Everyone can continue to fill their tool belt. AND MY MANTRA- TAKE CARE OF YOURSELF. Do you believe that Mental Health is just as important as physical health or do you believe that one is more important than the other? Both are equally important. If you think about it, they aren’t that far from being the same thing. A disease of the brain is physical health. Do you believe that Mental Health needs to be a required subject in school? I think our “Health” classes should be so much more inclusive of mental health and current issues. I also think kids need to learn how to establish credit, do their taxes, hang curtains, cook, sew, and clean. I don’t know why we are cutting home economics classes. What is your opinion of the mind-body connection? 100% believer. I see it in action every day. People often are so occupied in their mind, with anxiety, depression, mania, panic, etc that they cannot hear their bodies. Or the other way around- the mind is so occupied that it creates what we call somatic symptoms. They feel very real, and cause real ailments, but are caused by the response to the mind. How we fuel and take care of our bodies will directly affect our mind function, making it a complex relationship. What is the number one sign and/or symptom that you notice in adolescents who are dealing with something internally, yet refuse to talk about it? Look for their outlet. Art, music, and writing are the biggest I see. They will often show their feelings in these things. I find that caregivers have an intuition about their kids and know that something is off. Trust your gut. In your opinion, what signifies a “safe” environment for anyone who is struggling with a Mental Health disorder? Somewhere that person can be themselves without fear of harm mentally or physically. Empathy is going to play a huge role here too. Teach those kids empathy! The more empathetic people in this world, the safer it will be. How can we assure that our children’s Mental Health needs are met on a daily basis? We can’t. But opening the lines of communication without judgement is going to create trust for those kids to tell us what they need. This also teaches kids what healthy relationships look like and help them to be a better partner in the future. How can we be there for those who are having a hard time, even when we don’t understand what that person is going through? Offering to listen. You don’t have to fix things like most people naturally want to. Just being a safe outlet is enough. Admitting you don’t understand is step 1. People usually respect that someone isn’t assuming they know how they feel. Asking what they need is step 2. Maybe you can help, maybe not. Knowing your boundaries will be important. Referring to a professional when necessary is step 3. As a society, how can we support the Mental Health Community better? More awareness, of course, but what is a piece of advice that we could all take action on immediately? Start at home. The next generation has the opportunity to be way more “woke.” Be on the lookout for local assemblies, rallies, conferences, or anything highlighting mental health. Attend if you can! These questions need to be asked. Especially for us parents who not only struggle ourselves; but who are raising kids who are struggling, too. Community is so important and we need to be leaning in on each other the best way that we can and we know how. You are never alone and you ARE enough; its important that you know that! Taking the first step into properly caring for yourself and for others is knowledge. So praise to you for giving this a read and wanting to find answers. There is always someone out there who can understand and be there for you. If you have been thinking about what to do for quite some time; I encourage you to find the right therapist for your child and to find someone who they are comfortable with. There is always room for hope. No matter how impossible it may feel. To find Ariane Waller, you can visit her website here. Have any more questions or feel like there is something more specific i should touch on? Feel free to drop them in the comments below, or, as always, send me an email! Your post has touched me very closely, treating a subject as delicate and important as this. Thank you for starting a conversation about it. Mental illness is an epidemic in our society and it necessary to share more information about it for those who need it. She sounds like a wonderful person with a lot of intelggiance. These are such great questions. One of the very first things that my son’s doctor recommended when he was diagnosed with ADHD is for all of us to have counseling. The ADHD mind is always moving. It overthinks to the point that it makes you anxious because you can created hundreds of scenarios before the brain can rationalize those fears. It’s like when you watch a scary movie and then have to go to the basement or you decide to go to bed but have to climb some stairs in the dark. Your mind starts to think of Chucky from Child’s play coming after you and so you skedaddle up the stairs at a running pace because somehow you’re more susceptible to him catching you the moment that the lights are out. Is this something that will really happen? No! However, you feel safer in the safety of your bed, under your covers. Then you laugh because your fear was irrational, but you’ve had time to think it through. I like that recommendation! I think it’s important that we all understand these types of things more because they are more common than we know. Bold step missy, I am happy that mental health is no longer silenced in society. People are more aware of the threats that mental health pose in our community and how anxiety can play a big part in our daily lives. People forget that children go through a lot these days. They’re expected to be many adults and it’s taxing.